In Limit Texas Hold'em Poker Games, bets and raises are set at a fixed amount. A typical limit game would be $10/$20 ($10 minimum bet for the first two rounds, and $20 minimum for the last two rounds). The big blind would be equal to the minimum bet ($10) and the small blind would be half the minimum bet ($5). Each round of betting is capped at a maximum number of raises, depending on the rules of the game. In online Hold'em games, raises are generally capped at four bets per round. New players will start with low-limit games and gradually work their way up to higher limits as their skill progresses. Pot Limit Texas Hold'em Poker is similar to No Limit Hold'em, except that the number of chips currently in the pot determines the maximum bet. This allows players to experience the excitement and strategy of No Limit Texas Hold'em without the necessity of a large bankroll. Pot Limit games usually have a maximum buy-in (the number of chips you start with) to keep the game competitive. 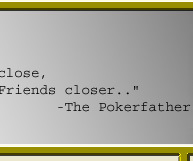 In No Limit Texas Hold'em Poker, the number of chips you have in front of you determines the maximum bet. Players can bet and raise by any amount, and at any time, a player can go all-in by pushing all their chips toward the center of the table. To call, the other players at the table must push in all of their chips, up to the amount of their opponent's all-in bet. This is the type of Hold'em that is played on the pro level, and on TV shows such as the World Poker Tour and the World Series of Poker. A disc or other marker is used to indicate which person is the dealer for the round. Action is always initiated to the left of the dealer and continues in a clockwise manner. At the end of each hand the button is moved clockwise to the next player, who then becomes the dealer. There are no antes in Texas Hold’em Poker, instead forced bets called blinds are used. Before the cards are dealt, the person to the left of the dealer posts a bet called the small blind, which is usually equal to half of the minimum bet. The person to the left of the small blind posts the big blind, which is equal to the minimum bet. The first two cards are dealt to each player face down (these are called the hole card), and the person to the left of the big blind starts the first round of betting. (Notice that the big blind and small blind do not get to look at their cards before betting, thus the term blind). In the first round of betting, each player has three options: call, raise or fold. To call, the player must place a bet that is equal to the last bet placed. (For the first player in the round, this would be equal to the minimum bet.) A player may choose to raise their call bet by an additional amount, which the other players will then have to call. If one's hole card are not favorable, the player may simply choose to fold and sit out the round. After all the players have finished the first round of betting, the first three community cards are dealt face-up on the board. This is called the flop. The second and all subsequent betting rounds start with the first player to the dealer's left, and players now have the option to check. 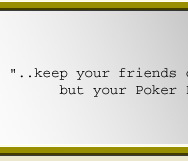 By checking, the player indicates interest in the pot without placing a bet. Any player may choose to place a bet, which the other players must then call. Players can still raise, if a bet has been made, or fold, if their hand is not favorable. After the second betting round, the fourth community card is dealt face-up (this is called the turn card). In limit games, the minimum bet doubles in the last two rounds of betting. After the third betting round, the fifth and final community card is dealt (this is called the river card). A final round of betting ensues, and afterwards each player turns his or her hole card face up. The highest hand that can be made with any combination of a player's hole card and the five community cards wins the pot. If two or more players have the same hand, the next highest card in the player's hand (the kicker) is used to break a tie. If there is no kicker card (the tied players have used both hole cards, or have the exact same hand), then the pot is split between them. 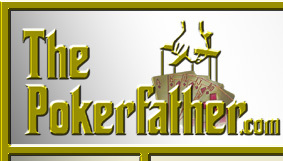 The dealer button is then passed clockwise to the next player and another round of play begins. 1. The dealer deals each player 2 down cards. 2. 1st round of betting. 3. The dealer burns a card and deals the flop. 4. 2nd round of betting. 5. Another card is burned and a fourth community card the turn is dealt. 6. 3rd round of betting. 7. A last card is burned and the final community card or river is dealt. 8. The last round of betting. 10. The person who initiated the last round of betting shows his/her cards first. A. Both of the player’s hole card along with any three cards from the community board. B. One of the player’s hole card along with any four cards from the community board.